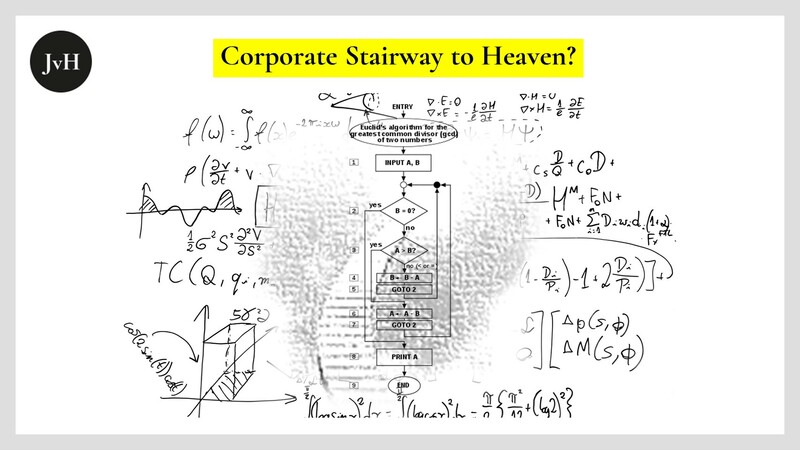 Data Paved Stairway to Corporate Heaven? Last week I stated that a general master plan for individual or business success, as outlined in Ray Dalio’s #Principles, is a good thing – in principle 😉. Provided the plan makes sense, it’s good because it serves as a useful heuristic to make sure I’m on course. The disadvantage of such a general plan, of course, is that it doesn’t spare me the task of repeatedly judging for myself whether I’m on the right track and where I’m on it. Now, says Dalio, he is developing software tools, “algorithms,” that would help any company’s strategists and strategy managers perform these assessments. Software, he says, is obviously in a better position than the human brain to “quickly” collect “all” relevant data and thus arrive at an appropriate assessment of the current situation. What Dalio wants to do has been branded as “descriptive”, “predictive”, “diagnostic” and #PrescriptiveAnalytics by #datascience for quite some time now. You may see from my tone that I am a little sceptical about how useful such software support is, especially when it comes to the last bit, prescriptive analytics. Not only @RayDalio, but almost everyone in #datascience claims that descriptive analytics answers the question: “How can we do that?” #PredictiveAnalytics supposedly explains “What’s going to happen” and #DescriptiveAnalytics is alleged to tell us, what has already happened. I’m one of those unruly sceptics who wonder why we should ask: “How can we achieve this” when we supposedly already know via predictve analytics that it will happen anyway. But perhaps that is cheap rhetoric. After all, you may want to do something faster, cheaper or better, although you already “know” it’s going to happen. What I find more disturbing and questionable is that we should be able to trust our algorithms to filter out from the sea of all available data “all those relevant” that are necessary for a decision on how best to manage what is going to happen anyway. Let’s not go back to the oft told story of @nntaleb about the potential impact of the highly unlikely, that no one and no algorithm will ever be able to foretell. No reasonable software developer would claim that he or she will be able to predict the future under any circumstances. For me, at any rate, it would be quite enough if I had a tool that would show me the most likely result of a set of conditions, that is exponentially larger than any set my very small human brain could reckon with. Now, in many business areas, it is certainly already possible for software to carry that out, i.e. monitor whether we are still on course to execute our strategy (again Descriptive Analytics). Especially in the financial sector, where targets are easy to quantify, all this is already common practice for data scientists. There, human intervention has already become largely superfluous, i.e. it is not even necessary to have humans decide which goals to follow. But will this be possible in every business area? I strongly doubt that. The difficulty is not the required volume of data. It’s their nature: By definition, some industries always need to adapt to current circumstances. Current circumstances can sometimes and with some degree of certainty be related to root causes. But not always. It’s wrong to assume that the future is just a prolongation of the past. 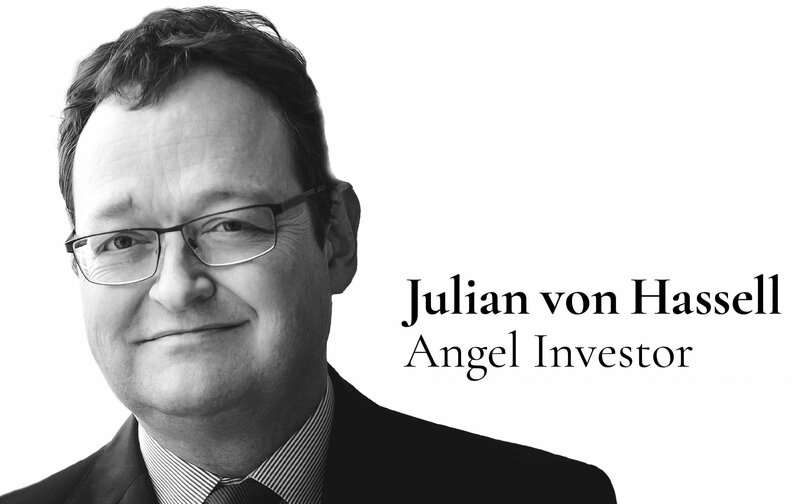 Venture Capital is one of the branches where this is plainly obvious. Vom Nutzen und Wert der Daten Einführung: Je richtiger das Datum, desto geringer sein Wert?